Attending were Charley Dils, Mark Jensen, Dave Dittemore, Terry Fuller, Kristi Nebel, and Steve Nebel at 11:15 a.m. on Monday, August 13, in the Tacoma office of Congressman Adam Smith. He is now ranking minority member of the House Armed Services Committee. Our meeting had been scheduled for exactly fifteen minutes but started around ten minutes late due to a phone conversation which delayed the congressman. He nonetheless gave us an additional ten minutes, adjourning at 11:35 a.m. (though I had been told his entire day was filled with fifteen-minute meetings with his constituents). We had decided to keep our own speaking to a minimum of three minutes each in order to make our points and subsequently allow time for questions and answers. Following introductions, Smith was quite cooperative in listening to the three chosen, and in allowing each of us to communicate, in the end. Dave Dittemore spoke first. He presented the congressman with a nametag from the uniform of a local soldier named Smith who quite recently committed suicide, for which Rep. Smith thanked him; he appeared to be saddened and thanked Dave for the gift. Dave argued that a culture based on militarism is emerging in the U.S., with terrible consequences. Rep. Smith agreed that diplomatic solutions to problems are better than military ones. Mark Jensen then took a turn, thanking the congressman for once again opening his office to our groups. He had prepared a letter (#2 below) signed by all of us, which is based on a June 7 statement available at the United For Peace of Pierce County website ( http://ufppc.org/ufppc-statements-mainmenu-29/11025/ ). It is a statement approved by the group arguing that pervasive secrecy on the home front which has become endemic since 9/11 is undermining democracy in the United States. With regard to the Smith-Mundt Modernization Act of 2012 (HR 5736), Rep. Smith said that the widespread concern the bill had elicited was unjustified. Charley Dils than proferred the opinion that drone warfare itself is immoral, causing many civilian deaths and Steve added that it has a particularly terrorizing effect; I added that it's alienating Pakistan from the U.S. Smith defended drone warfare against terrorists, saying that during targeting more is done than we know to avoid civilian deaths. He went on to opine that guided missile bombs are no more moral than drones. In concluding, the meeting Congressman Smith lauded our groups for continuing our efforts to research and discuss these topics and in shaking my hand, assured me we'll meet again. He says he fears that foreign policy issues are being neglected in the 2012 political campaigns. Finally, he took time to pose for photos with us before we left. Left to right: Terry Fuller, Charley Dils, Adam Smith (D-WA 9th), Dave Dittemore, Kristi Nebel, Mark Jensen, Steve Nebel. 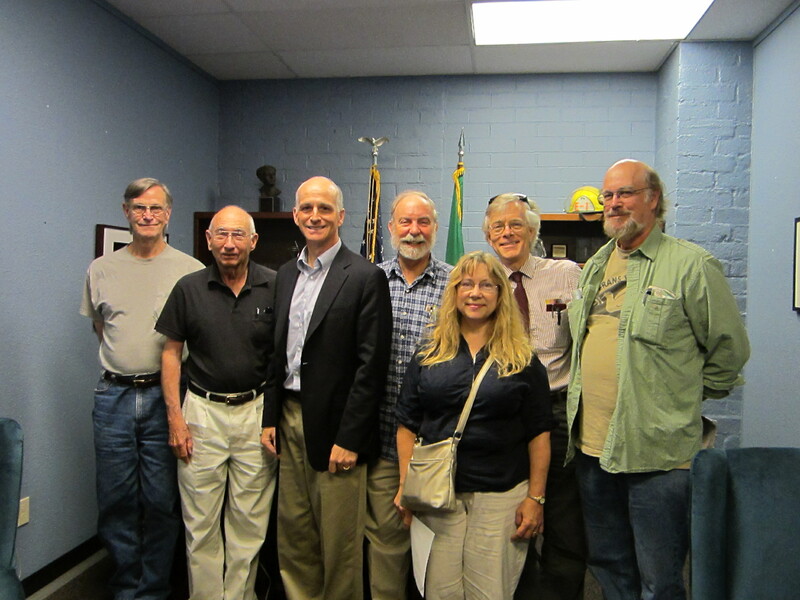 We much appreciate your taking time to meet again with members of UNITED FOR PEACE OF PIERCE COUNTY. As you know from many previous meetings with us, UFPPC formed in November-December 2002 to oppose the U.S. war in Iraq, and has continued during the past decade to be a positive voice. Our well-known website, with more than 15 million hits, has conveyed widely our view that in an era when American policy has often been guided by other principles, peaceful, multilateral diplomatic solutions to international problems are most needed in the world today. We know you share this perspective, and admired your expression of it in your recent Foreign Policy article, "The Romney-Cheney Doctrine." Today we would like to convey to you some of our concerns regarding the domestic consequences of the era of war that the Bush administration began, and which persist today despite a change of administration. On June 7, UFPPC adopted a statement ("Pervasive Secrecy: The Way We Live Now" -- available on the web at www.ufppc.org/ufppc-statements-mainmenu-29/11025/) that praised you for proposing an amendment that would have overturned a provision in the National Defense Authorization Act, §1021(b)(2), that empowers the U.S. Government to hold American citizens in indefinite detention without charges for the duration of the "war on terror." We applaud you for this effort. This legislation, which the president signed into law at the end of 2011 and which unfortunately remains in force, is all the more disturbing in that none of the parties involved in promoting it have offered a plausible explanation of what could justify such an extreme measure at this time. However, we also noted in our June 7 statement that you were a co-sponsor of a bill (H.R. 5736 -- Smith-Mundt Modernization Act of 2012) to overturn what has long been widely perceived to be a barrier to the U.S. Government engaging in secret propaganda directed at a U.S. domestic audience. We take the occasion of this meeting to ask your reasons for doing so. At present, 22 USC §1461(1)(a) declares that "no funds authorized to be appropriated to the United States Information Agency shall be used to influence public opinion in the United States." The text of the bill you are sponsoring amends this to allow materials designed to influence public opinion to be distributed "in the United States." We fear that this will authorize the government to create and plant misleading or false stories, engage in disinformation, discredit dissenters, etc. In a nation that aspires to have a government "of the people, by the people, and for the people," we think this is inappropriate. We think it is inappropriate because it renders the citizenry incapable of making an informed judgment about what the government is doing in its name. For example, in the current crisis in Syria, Americans are unable to judge to what extent the regime in Syria is ruthlessly suppressing human rights, and to what extent it is responding to a secret proxy war designed to overthrow Bashar al-Assad in which the U.S. is a major player. We have reached the point where not just the government's actions, but also the rationale that guides its actions can be state secrets. The "state secrects" doctrine has been abused in court again and again, and recently the administration refused to make public its reasons for killing several American citizens without any judicial process by classifying the relevant Department of Justice memorandum. Meanwhile, in the elaborate and secretive proceedings against Pvt. 1st Class Bradley Manning, the accused has been charged with "aiding the enemy," a capital offense, for leaking information in order to make it available to the public. This is, frankly, absurd -- unless, of course, it is the public that is the enemy. Many forms of secrecy are spreading in civil society. For example, the 2010 Supreme Court decision in Citizens United facilitates secrecy for wealthy contributors seeking political influence, and the publication of the book Top Secret America by Pulitzer Prize-winning author Dana Priest and national security expert William Arkin describe "a largely invisible parallel universe of more than 1,300 federal agencies, nearly 2,000 private companies, and 854,000 people doing 'top secret' work,'" in the words of Bob Drogin (Los Angeles Times, Oct. 17, 2011). Obviously there are aspects of government and situations in which secrecy is demanded. But pervasive secrecy makes democracy untenable in the long run, and appearing first as a product of the Cold War, this secrecy is nothing new. Pervasive secrecy means the American public is unable to evaluate properly the behavior of nations and groups that the U.S. regards as adversaries or enemies. Their overtly hostile acts, which are usually presented to the public as "aggressive," are often defensive in nature. (Such, we now know from historical research, was the case in the Gulf of Tonkin incident in August 1964. Such, we believe, is also the case in present stand-off with Iran, in regard to which your rhetoric tends to be too belligerent, in our view.) And all too often, the U.S. government is going so far as to consider the efforts of American citizens to maintain open government to be hostile acts as well. With admiration and respect for your tireless work for the public good, we appeal to you to exert your influence to fight against this ever more pervasive secrecy in American life, and by doing so to help sustain the democratic system of government to which you have devoted your exemplary career.